LOS ANGELES, Mar 24, 2012/ — What do new music artist Erica Chase, Fergie, ParisHilton, Gwen Stefani and Kelly Osbourne all have in common? They’ve all been spotted on the red carpet wearing DinaBar-El evening dresses. 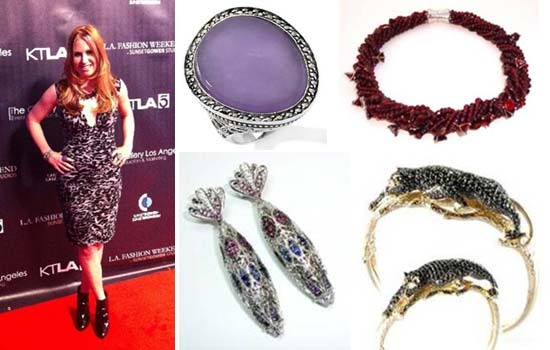 Erica, the latest rocker to hit the red carpet in one of the edgy designs, was a personal guest of the designer-to-the-stars when Dina debuted her latest evening collection during Los Angeles Fashion Week for the Fall 2012 collections at Gower Studios in Hollywood. In true rocker chic(k) style, Erica rocked the red carpet in a sultry, gray and black animal print cocktail dress with an unapologetic, plunging neckline. Shec omplemented the dress with jewelry by Dallas Prince Designs including a multi-strand 14K gold martini necklace with an astonishing 900+carats of African garnets as well as filigree earrings filled with sapphires, rhodolites and diamonds, an organic lavender jade and marcasite freeform ring and three panther bangles with a combined weight of more than 21 carats of red garnets and black sapphires. As Los Angeles Fashion Week drew to a close, Erica (www.EricaChase.com) will be gearing up to go into the studio with legendary, multi-platinum producer Dana Strum (Slaughter/Vince Neil) who is producing her upcoming album.